(PRLEAP.COM) MINNEAPOLIS, Minn., Aug. 16, 2018-IdeaGist.com, the world's largest digital incubation platform, announces a global collaboration to address the impact that emerging technologies such as artificial intelligence (AI), 3D printing, smart robots, and intelligent vehicles are predicted to have on worldwide workforces. According to IdeaGist.com founder and CEO Hassan Syed, global communities need to prepare now for the disruptive nature of emerging technologies and their potential impact on the way the world conducts business, oversees workforce, and leverages innovation by developing capacity and demand. Capacity planning is the process of determining the production capacity an organization needs to meet changing demands for its products. For small and underprivileged communities, the cost of assessing, planning, and executing capacity and demand is prohibitive. However, delaying capacity and demand planning for too long can cripple disadvantaged communities and bring about devastating financial and social consequences. IdeaGist's Emerging Technology Accelerators (ETA) initiative focuses on capacity building in seven key emerging technologies: AI, 3D printing, blockchain, internet of things (IoT), augmented reality, intelligent vehicles, and smart robots. Beginning with 14 founding members, an additional 50 organizations are in the process of joining IdeaGist's ETA initiative. The goal is to have 100 communities worldwide join IdeaGist's ETA by the end of 2018. Under the initiative, IdeaGist will provide a platform for knowledge transfer between participating communities, enabling them to both provide and receive talent, technology, and training collaboratively. Economic development agencies, educational institutions, science & technology parks, accelerators and incubators and other organizations that join the initiative will have exclusive access to global knowledge transfer portals for each technology represented in the program. 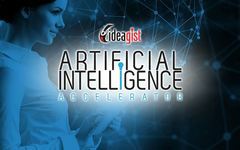 IdeaGist will launch the ETA program with AI as the first accelerator, followed by blockchain technology in October, 2018. Communities can join the initiative by completing an expression of interest form. "Our solution is to develop a global network of communities, connect them to the experts in key emerging technologies, provide them with a sector-by-sector job impact analysis, and give them up-skill and re-skill training content," Syed says. "This will better prepare each community to manage the inevitable disruption this next generation of emerging technologies will have on the world's social and economic models in the near and distant future." Technology plays a critical role in addressing some of the world's most pressing challenges, and also poses significant economic and social risks if communities don't plan ahead. The world is entering a fourth Industrial Revolution, so it is vital that shared norms and protocols are developed to ensure that technology serves humanity and contributes to a thriving and sustainable future. "As the world's largest digital incubation platform, IdeaGist is helping innovators and entrepreneurs from all 195 UN recognized countries," Syed says. "During the past five years, our team has been building a community-based collaboration platform that will be used as a foundation for this collaboration." ● Bir Ventures USA Ltd.
● Universidad del Mayab, Mexico. For more information, please visit the IdeaGist MIT Solve Page, email IdeaGist media director Liz Ernst at liz@ideagist.com or call our office at or call our office at +1 612-666-9247. IdeaGist is the world's largest digital incubation platform, linking people from all 195 UN-recognized countries, hosting more than 2,800 startup ideas and offering access to more than 1,400 mentors. IdeaGist is the digital adaptation of traditional business incubators, developed to meet global demand for online access to startup development services, improve effectiveness, and help fill incubator capacity gaps on-demand and at low cost.